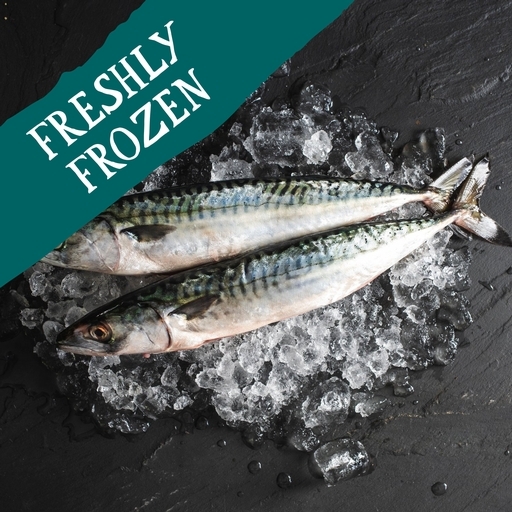 Wild mackerel sustainably line-caught off the coasts of Devon and Cornwall. With their sleek shape and iridescently striped flanks, mackerel are instantly recognisable. The flesh is firm, deeply flavoursome and rich in Omega-3 oils. We think fish tastes best served on the bone when possible, so we’ve cleaned and gutted them, but left them whole for you to grill, roast or BBQ. Serves 2. There are 2 or 4 whole mackerel per pack. Don’t miss our wild mackerel. We buy from small local fishermen, so supplies are limited. It will be available for deliveries from 18th February, while stocks last. Trim the fins and tail. Cut 3-4 diagonal slashes into each side of the fish to allow the heat to penetrate. Oil and season well on both sides. Stuff the cavity with some aromatic lemon, herbs and bay. Bake in the oven at 200˚C/Gas 6 for about 15 mins, or until the flesh pulls easily away from the bone. You can remove the head before cooking if you like. Prepared in a kitchen where Celery, Cephalopods, Crustacea, Dairy, Eggs, Fish, Gluten, Mustard, Shellfish, Soya, molluscs, nuts and sesame are also handled.